I love Thai food because it is often dairy and wheat free. Tonight, I was in the mood for some Thai flavors, but wanted to try something other than my usual Pad Thai. So, I made Thai Salmon and Cole Slaw. 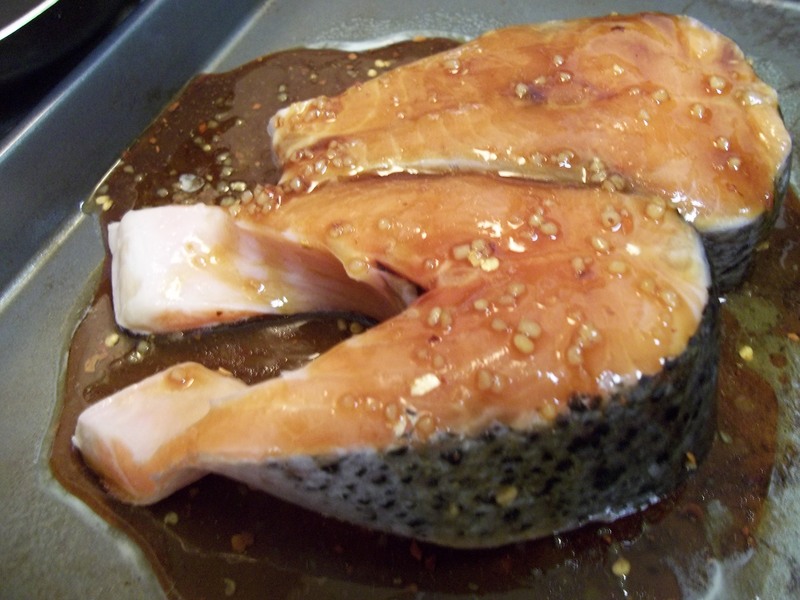 The salmon had great flavor to it, and was different than just baked salmon. I was particularly pleased with the cole slaw. Again, the flavors were fantastic! And the cole slaw, which just looks like regular cole slaw, but tastes so different! And, finally, the recipe… happy allergy free eating! Spray a cookie sheet with cooking spray and place 2 salmon steaks on it. Combine 2 tbsp. sesame oil, 2 tbsp. honey, 2 tbsp. tamari (wheat free soy sauce), 1 tsp. garlic, one half tsp. red pepper flakes, and 2 tsp. ginger and mix well with a fork. Smother the sauce on the salmon so that the steaks are covered with sauce. Bake at 375 degrees for about 25 minutes, or until center is cooked. Combine one quarter c. mayo, one quarter c. rice vinegar, one eighth c. tamari (wheat free soy sauce), 1 tsp sugar or agave nectar, 1 tsp lemon juice, one half tsp pepper and mix well with a fork. Chop one red pepper and one yellow pepper into small bite sized strips, if you want some extra crunch. 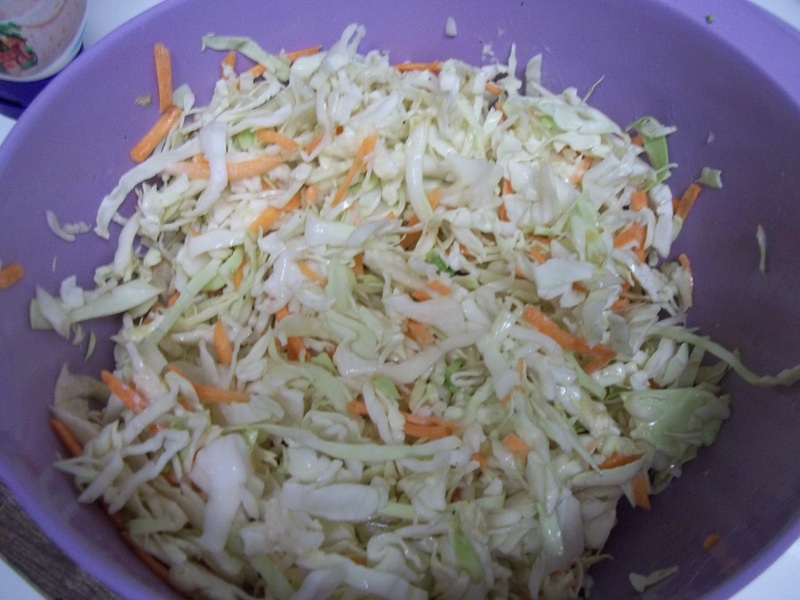 In a large bowl, mix one bag of cole slaw and chopped peppers. Pour sauce over slaw mixture and toss to combine. Let sit for a few minutes before serving, so the flavors can combine. Finely cut scallions to sprinkle on top and serve.